The Tower of London's first female beefeater has joined her new colleagues publicly for the first time. Moira Cameron, 42, from Argyll in Scotland, said she was "immensely proud" to have secured the role which she will take up in July. 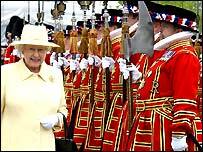 She appeared in her present warrant officer 2 uniform, but will be measured up for her £1,000 beefeater uniform when she starts the post. Her job will involve giving guided tours and guarding the Crown Jewels. In order to fulfil her role as tour guide Ms Cameron must learn all about the Tower's 900-year history. "In more recent years I have started to get more interested in history and this is a fantastic place to learn, what a school. "I'm looking forward to starting the job, meeting people at the gate, welcoming people into the Tower is all part and parcel," she said. Ms Cameron has spent the required 22 years serving in the forces and is currently a chief clerk in the Adjutant General's Corps in the 145 Brigade. 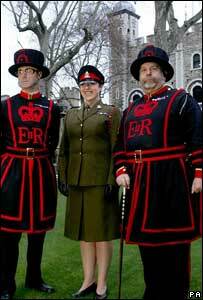 She fought off competition from five men to win the post, which makes her the first female beefeater in 522 years. Ms Cameron said she would cope with working in a male-orientated job the same way she had done in the Army. "All the boys are ex-military so we are all singing from the same song sheet," she said. In the role of yeoman warder she will earn about £20,000 a year and will have the use of a subsidised apartment in the Tower of London. Chief Yeoman Warder John Keohane said Ms Cameron would carry out her duties and role in exactly the same way as her male colleagues. He explained that taking on their first woman beefeater reflected the changes to the role of women in the Army. "Now women have maternity leave..they continue their role in the armed services so they are now able to meet all of our criteria, including 22 years service." He also said he was confident she would be welcomed into the ranks by the other beefeaters. "I think my colleagues are looking forward to a challenge and are more than happy to see her come here," her said. "I think that she will want to prove the point that she is equal to the opportunity given to her." New yeoman warders swear an oath of allegiance, that dates back to 1337, on Tower Green once the Tower has closed to the public. After the ceremony the health of the new beefeater is traditionally toasted by the chief yeoman warder.